Large entertaining deck out the front to capture panoramic views of the sea out front and hills behind. Beautifully designed beach house built for relaxation and fun times at beautiful Surfers Beach only a 2 minute stroll away. Pool table, Air Hockey table, 5 bright and beach-themed bedrooms, 3 living areas, 2 flat screen TV's & DVD players along with a selection of films and games. 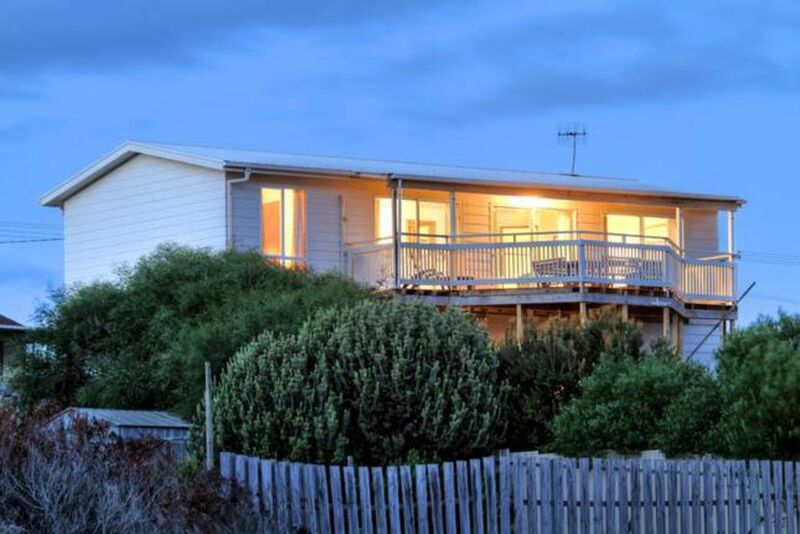 Split system RC/AC's and only a stones throw from Middleton Beach, popular all year round for surfing. 3 Queen bedrooms, two have ensuites. Total of 9 beds. Perfect for multiple families. Fully fenced backyard and pets very welcome to stay outside. 53 Hero Ave Middleton. Sleeps 12 - please note: guests to SeaWatch are required to provide their own linen, that is, towels, tea towels, sheets, pillowcases and bath mats. Doona's, doona covers, blankets and pillows are provided. 3 Queen beds , two upstairs & one downstairs, two with 2 way ensuite. Bed 4 (upstairs) sleeps 2 (bunk beds) while bedroom 5 (downstairs) sleeps 4 (2 sets of bunks). Fans in all bedrooms. 2 full bathrooms, one upstairs & the other downstairs, along with a third separate WC. Downstairs laundry with washing machine. Adults living/entertaining area upstairs with large deck overlooking the beach and Victor Harbor and beyond, with 2 further living areas downstairs with large pool table /air hockey table. Large gourmet kitchen with stainless steel appliances leading onto a huge deck overlooking Surfers Beach providing 270 degree views through to Victor Harbor and the hills behind. There is parking for 5 cars in addition to a single undercover carport. Outside there is a fully enclosed, private Hot water shower. Hero Ave is located 2 streets back from the beachfront at beautiful Surfers Beach, Middleton. Not only a great place for surfing and body boarding, try beach fishing at Middleton or nearby Pt Elliot! Watch whales frolicking from the elavated deck or explore the many rockpools. The townships of Port Elliot, Victor Harbor and Goolwa are located 5kms to 7 kms away where visitors will find top quality golfcourses, restaurants and winerys as well as cafes and boutique shopping. There is a childrens playground located a 2min walk along Hero Ave along with a newly developed wetland area to explore. The Goolwa - Victor Harbor bike track is a min away!! Great clean house with plenty of room. Convenient walk to the beach. Highly recommend it! Simple, Value for money, Close to beach, Spacious groom nd floor bathroom, Nice balcony. We had a good time there. Six adults and five children - comfortable, relaxed, had everything we needed. We all loved the place, the kids didn't want to leave! Definitely want to go back in warmer weather.